I use my wooden tea tray since 2003 and it serves me well since then. Unfortunately, because of its size it’s quite unhandy to use on my work desk, and since last winter I had to work quite a nights, I decided to get a smaller, ceramic tea tray. This is a celadon tea tray made by Taiwanese artist Xu De Jia I acquired from Guang at HouDeAsianArt. 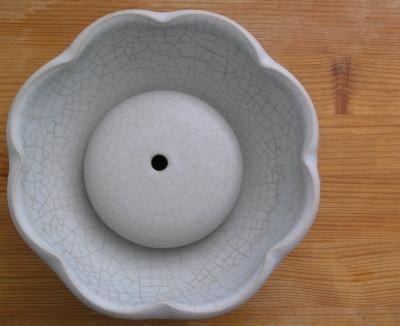 The tea tray is made from bluish "Chin Tzi" celadon in stylized form of Lotus With Eight Petals. The tray is quite heavy and feels massive and the tea stand (isle) found in the center of it is removable. First, let's describe how celadon works. When purchased, it’s clear and translucent without any visible cracking – yet, these cracks are there, they are just hollow and hard to be seen. If you click the top image (it’s the outside wall of tea tray), you can see, that from closer look the cracks are there. The bottom picture is taken from the surface of tea stand, where the cracks are already filled with tea and clearly visible. 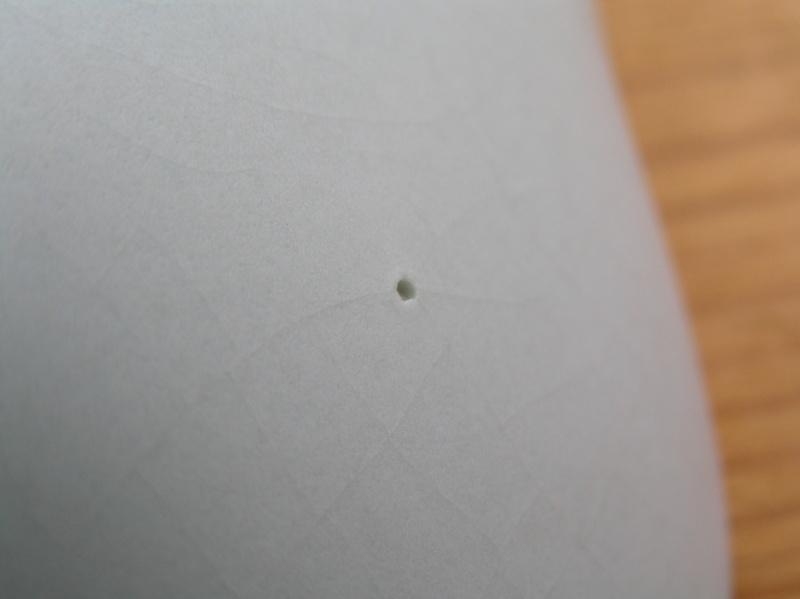 These cracks appeared as soon as on my third use of the tea tray, and to my surprise, they are much darker on the upper sides of tea tray, than on the bottom, though the bottom is filled with tea most of the time I use the tray. The setup of this tea tray is quite easy – the teapot stands on the isle, so I can feed it with tea broth. All unused tea is collected in the bottom of the tea tray. Fortunately, all my pots under 200 ml fits the isle. But my favorite function of it is the shui fan, container used to store wasted tea and used tea leaves. 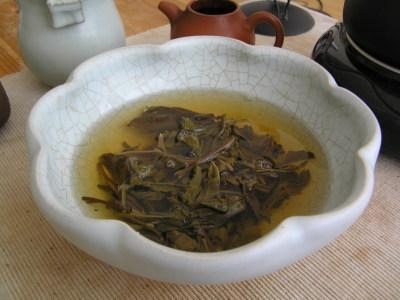 After my tea session I usually remove the tea isle and clean the pot dumping all tea leaves into the tray. Marvellous - and a matching gongdaobei, no less. How pretty. Very nice. I,m releived to see that I,m not the only one who dropped some serious cash into Hou De,s pocket. Ive a rather large collection of Xu De Jia,s tea ware and love each and every piece. 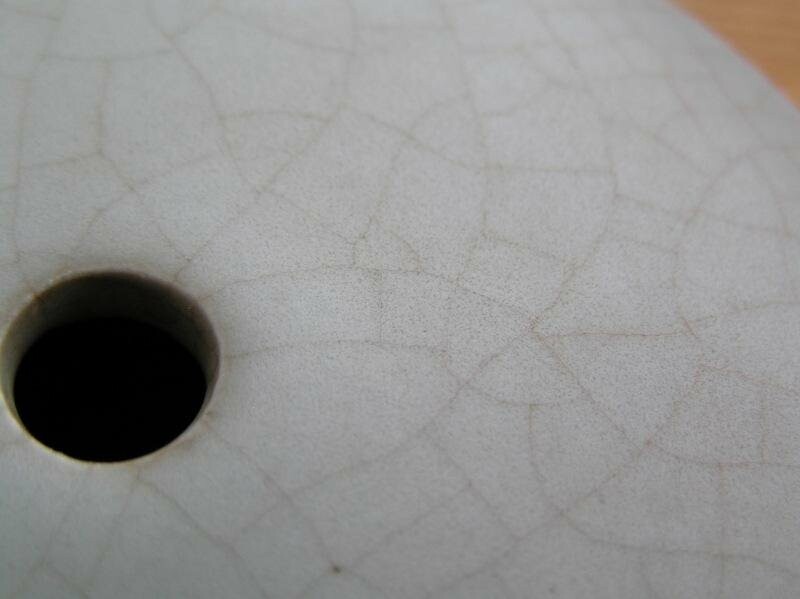 When my celadon began to crack it was a little disturbing but I got over it, that,s just what celadon does. Now I appreciate the cracking and even try to encourage it. These are very beautiful tea objects. I'm very (very) slowly adding to my teaware, and this is going to the top of my list of beautiful-must-haves. Tomas, thank you for writing such an interesting blog. I've been so encouraged lately at the quality of tea writing out there, and it's been adding greatly to my education and enjoyment. And what Hobbes said about the gongdaobei. Though I have no idea what that is. Gongdaobei (justice pot/fair cup) is the cup seen in the upper left corner of last to photos. 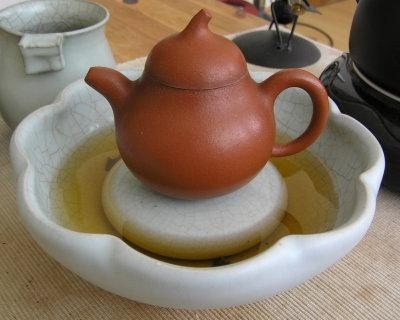 It's used in gong fu preparation - using the yixing teapot if you would spill the tea directly for the cups, the first could be much lighter than the last one (because the infusion time of the last cup is longer than that of the first cup). So usually the tea is first collected in the fair cup and then distributed to teapots, so everyone will have the same tea. It's great to see you posting more again, I like your blog a lot. It's pretty cool to see one of these tea boats in action; I've been enjoying the pics on Hou De for a while and imagining what the piece looks like with tea stains doesn't compare with getting to see the real thing! Count me as another person who's bought plenty of Xu De Jia's celadon ware--if I hadn't bought so much or if this piece were a bit less expensive, I'm sure I'd have already added one to my collection. On a side note, decent, affordable cha chuans seem to be one of the hardest items to come by online. Compared to gaiwans, pitchers, cups and yixing ware, they're next to impossible to find, and many of them are made of terrible "yixing zisha" that doesn't actually hold water because it's permeable. It's nice to see one getting such good use!